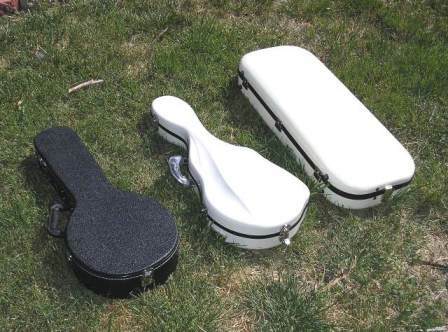 Music Instrument Cases: How much protection do they really give. Cases have always been a pain for me. Mandolin cases vary in quality from bad to excellent, and often the dimensions very from batch to batch, so one batch might fit my instruments, but the next batch don't. Unfortunately, here in Australia there is not a lot of choice, so I sometimes I find myself stuck waiting. Recently I have been looking around for a better quality case that doesn't cost too much, but provides better protection than the standard offerings in the music stores. This lead me to Eastman Strings, and a mandolin case duly arrived a few days ago by courier from the USA. This case is moulded fiberglass, made in China, and I was impressed by the quality of construction. So much so I am going to offer the cases to customers in addition to the Australian made Presto case. This got me thinking about how much protection a case provides, and the implications of colour choice. I have always favored white over other colours because it should provide better protection if it is left out in the sun. Musicians don't always agree with this choice of colour, black being the traditional colour choice for cases. White, or an ivory colour as usually supplied by the case makers, does show scuff marks readily and many people do not like this. Anyway, I thought I would try and prove the theory and maybe convert a few customers with some solid evidence. In any case, scuff marks can be cleaned off fiberglass cases with acetone. thermometer was then placed in each case and monitored every 10 minutes until the cases had been in the sun for a total of 2 hours. The air temperature was also measured at the same time. The thermometers were calibrated against each other and the temperature has been adjusted to take account of the small differences. Unfortunately I did not have a black fiberglass case, so the figures are not strictly comparable on colour alone. The results speak for themselves, with the Presto case providing the best protection, closely followed by the Eastman case. These cases averaged only 3-4 deg higher than the air temperature. The black case averaged 16 deg higher than the air temperature. The temperatures measured on this day would not have caused any damage to an instrument stored in it, but 37 deg measured in a case when the air temperature is only 19.5 deg is a concern. 2 hours in the sun is not a long time. The experiment was repeated the next day (a warmer day). This time the Eastman case did a little better than the Presto, so there is probably not much difference between the two white cases, but neither did as well on this warmer day, with the temperature inside the cases 7-8 deg warmer than the air temperature. The black case averaged 19 deg warmer, but peaked at 51 deg, which was 24 deg warmer than the air temperature. Relative humidity remained somewhere between 35% and 55% in all the cases so is not a concern. After this test I measured the temperature and humidity in my car (white wagon), which has been sitting out in the sun as well. Temperature was 48 deg, RH 13%, and this on a day where the maximum temperature was only 28 deg! Bearing in mind that the black case had an inside temperature of almost 20 deg higher than air temperature, it is no wonder musical instruments suffer damage if left in the back of a car in the usual black case. The moral of the story is not to leave musical instruments in a car in the sun. Unfortunately people forget and it happens, I have done it myself with almost dire consequences. The white fiberglass cases are definitely worth the extra cost for handmade instruments, particularly if you do tend to forget where your instrument is, or travel a lot. They provide much better protection from heat damage, and the cases are much stronger and able to withstand airport baggage handlers.